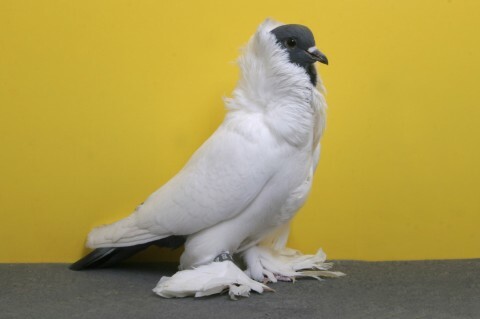 I agree with my studiomate Raul, these portraits of champion pigeons on the National Pigeon Association site are compellingly beautiful! It reminds me of one of my favorite books: The Fairest Fowl: Portraits of Championship Chickens. 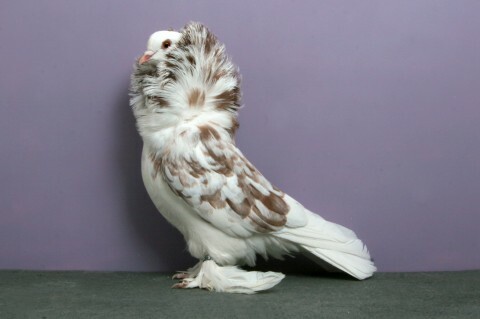 Is that even a bird: http://www.npausa.com/news/2010grandnationalchamps/Bokhara%20Trumpeter%20CH%20OH819%20Tally%20Mezzanatto.jpg ?????? it has no head? Wow. Who knew. #2 although it’s hard to argue against the one without the head and is #3 really just one bird. Back to going wow. Maby its me but, the black one looks like it just fell off a verry tall building. Oh I do love a good Pigeon!! Thank you, a couple of them look like saloon girls from the late 1800s. I got so excited when I saw these here! I read a book a few years ago, completely by chance (I passed by it in the library stacks and started flipping through it and had to finish it) – it’s a really interesting book about…pigeons! I had to scan some of the photos from it, it was really intriguing. These are beautiful… Yes to the Saloon girls from the 1800’s comment. I’m stunned and impressed. Now I know where the crazy-assed haute couture fashions come from. 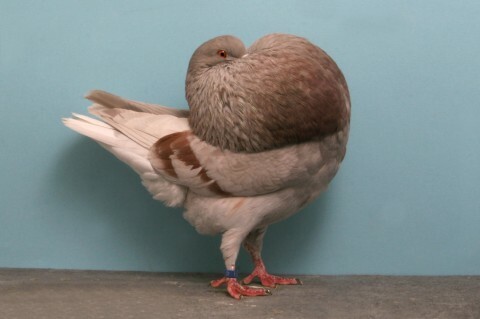 Next year in Milan there will be a runway model wearing a bouncy flouncy coat of (faux) feathers with an eyeball-high collar that channels Bazooka Joe, Virginia Slims, cammo and brothels. Wow these birds, and who/whatever created them, are fabulous! I like the Elvis one. These are amazing – at first i thought they were stuffed and posed! Breeding of defects. But the German translation is the perfect word for this stupid human behaviour to breed disabled animals: “Qualzucht”. no photoshop, pure nature? or manmade! who where’s the head on the 4th photo? I love pigeons; I even have a real pigeon coop where I keep 25 of them. When I breed them I breed for beauty but foremost for good flying techniques. I do agree with ChiliTierChnubler, ( 3 comments above me) that all those pigeons on the photos are funny but some of them are totally disabled. 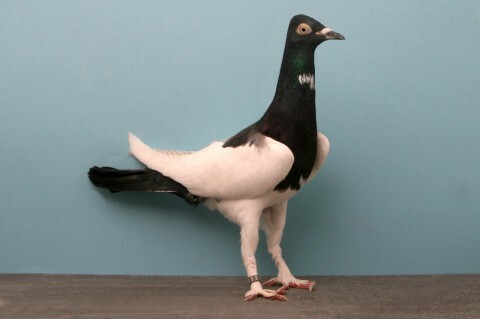 what elegance, what panache, what pigeons! 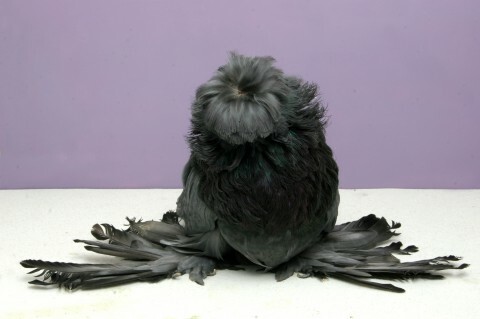 While this gives me a new respect for pigeon culture, I have to say that the way these birds are photographed is freaking me out! At first I thought they were taxidermied! you’re getting a lot of comments! and i saw your nod on Flavorwire, congrats! I saw a documentary about this sort of thing once. They are beautiful. I also feel badly that “man” has to mess with nature, as they are bred to have feathers in places they really shouldn’t. 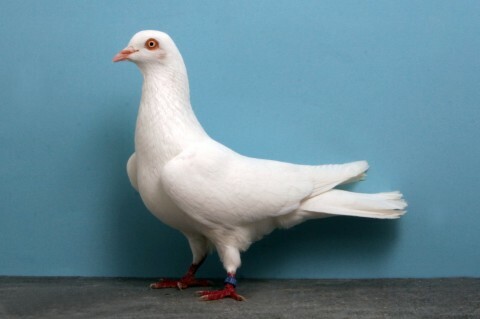 Then again, they’re probably the best kept pigeons in the world…mixed feelings, I guess. Anyway, thanks for posting as it’s been a topic for lots of conversation and some of them aestheically really are gorgeous. It still blows my mind that Mike Tyson is a world-class pigeon handler.